For ages I’ve been doodling Victorian-style script in the margins of sketchbooks, trying to teach myself how to write in copperplate. But I only really thought about actually trying to learn calligraphy properly when I arrived in London and found myself with nothing to do and nowhere to be. I’d applied for a few jobs and unpacked my suitcase (kinda), and so with no demands on my time I was filling my hours with aimless wanderings about the city. I found myself entering any shop that caught my eye – book stores, clothes stores, those shops that sell beautifully designed but utterly useless knick knacks – and there on the shelf of an art shop I found a cheap pen, some nibs and a bottle of ink. Art shops are very dangerous places for me, I get inordinately excited by those magical lands of pretty coloured pastes and sticks, and I tend to buy way more stuff than I actually need or would ever have time to use. But now time wasn’t an issue. For the first time in years I had no job or uni work or any kind of commitment to eat away at my time – I would never have a better opportunity to learn something new. 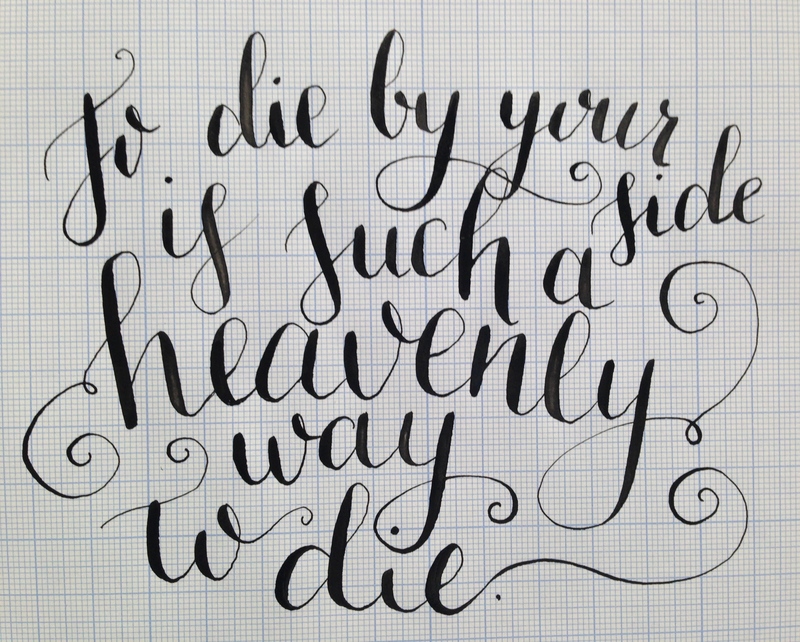 I walked out of that art shop with a basic calligraphy set, and I was determined not to let it go to waste. I still feel as though my style is very similar to a lot of other hand-letters I’ve researched, with a bit of my own handwriting in there too. It really is a skill that just gets better and better with practice – my room is now littered with half-dry, inky quotes and various experiments with different papers and inks. 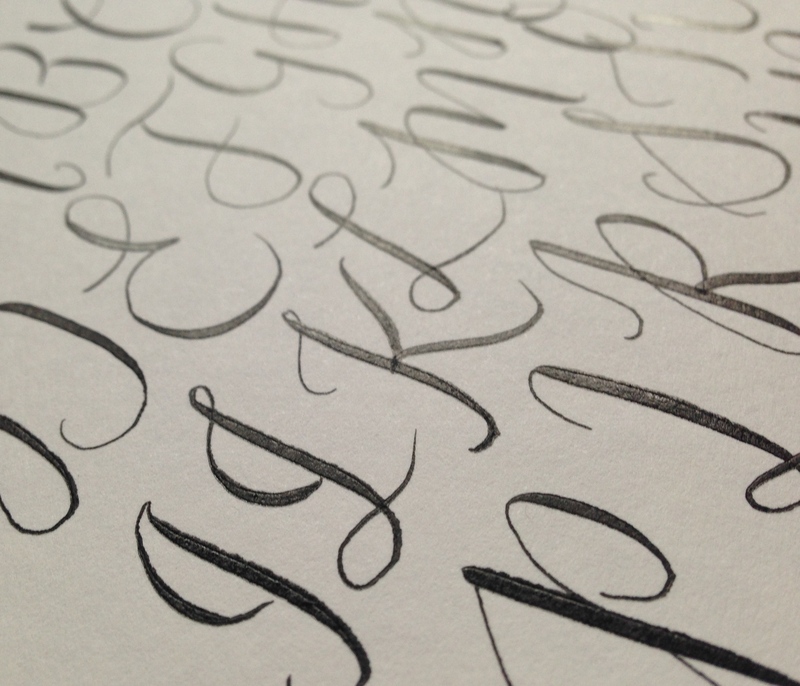 I still draw script in the corners of my sketchbook – actually they’ve started to fill whole pages – but now they look like they might actually turn into a work of art in its own right rather than just another ill-conceived scribble. Sound familiar? Ignore your brain. When it comes to personal decisions, our brains are pretty dumb, and tends to create obstacles where none even exist. Once you actually commit to making something happen, you’ll find those mountainous obstacles that your silly brain put in your path are actually more like molehills, and not so scary after all. In fact they are the opposite of scary, they are rewarding: the rewards are never ending. Ooo beautiful!! That pen is amazing too, gorgeous effect! Hi Zoe, thanks for writing this post — I too tend to get in over my head and needed a pep talk right now! 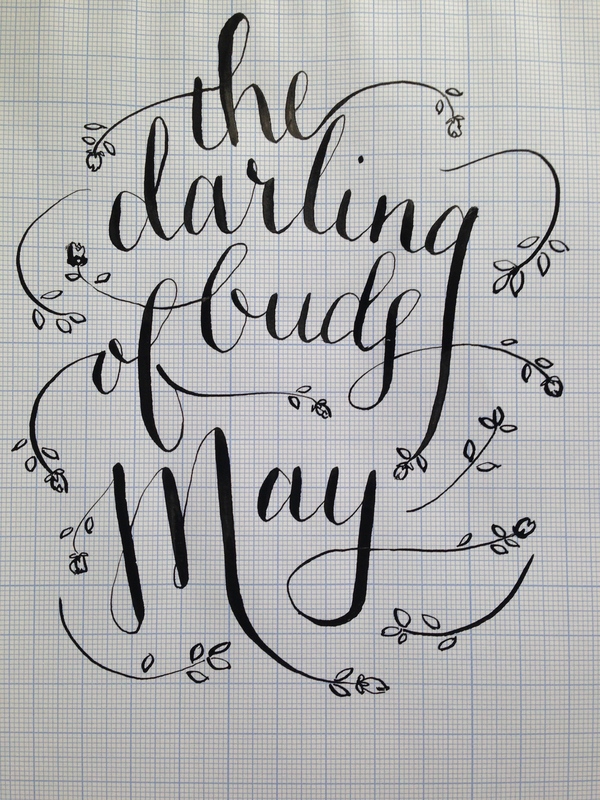 Love the calligraphy, especially the one with all the little rosebuds all over it!